The unannounced HTC Butterfly S has been photographed in China, and looks to be about the same size as its predecessor. The original HTC Butterfly came with a 5 inch screen offering 1080 x 1920 resolution. Based on leaked photographs, there is a change to the placement of the speakers. Instead of the one speaker on the back of the original HTC Butterfly, the HTC Butterfly S copies the HTC One with the two front facing stereo speakers called BoomSound. Other rumors focus on the Qualcomm Snapdragon 600 said to be powering the phone. The HTC Butterfly S is also expected to feature BlinkFeed, the screen that shows a visual representation of your social network feeds. There also is the possibility that the camera on the back of the device will use the same UltraPixel technology found on the HTC One. This uses a smaller number of larger-sized pixels, allowing more light to infiltrate the sensor resulting in better pictures under low-lighting conditions. 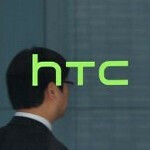 The HTC Butterfly S is expected to be unveiled during an HTC event on June 19th, along with the entry-level (but impressive sounding) HTC Desire 600. Love the red/black combination looks really good. Would prefer it to the One. The red/black is beautiful. But just wondering, arent they going to increase it to at least 5.5 inches? I dont like phablets, but they need products in that class because others are already doing it. That'll be later in the year - the 5.9" T6. This is just a refreshed Butterfly. The Butterfly is a funny animal - taller than most phones, but not wide enough to be a phablet. It's the absolute limit of what I would call a phone. Hmmm... maybe their phablet will be the One XL. Like the Sensation XL. "funny animal - taller than most phones" Don't troll please. Ummm.. What? Oh, I get it now! HTC land is a strange place. They have trolls that are anti themselves and butterflies that are taller than phones. Remind me not to visit that place. I doubt we'll see it as the DNA S though. Probably not worth the time/money for Verizon to add a speaker and marginally better processor. It could still happen, but I expect them to focus on the One launch instead. I don't think the DNA has sold well enough to justify a sequel. It's a good product with great reviews, and I like the feel of it, but I think Verizon is better off jumping on the One bandwagon. I agree. The brand has served its purpose of bringing attention to Android and serving up a branded opposition to the iPhone. It used to indicate a purer Android experience, but of late they're just as bloated as anything else on Verizon. I think Verizon was planning to sell the Butterfly S as the Droid DNA 2, but nixed that plan when the DNA petered out. That's why they're so late to the party with their One. It is going to be fat. The best they can do with boom sound, ultra pixels, and an amp is a 4.7 inch phone larger than some 5 inch phones at 9.3mm. They couldn't even get the HTC 8x below 10.1mm and this will be no different especially since it has a 5 inch screen. It is typical HTC quality. That is just how they roll. They like fat. why the article used "copies" instead of "follow" for a phone come from the same company? Think I find the One classier but the Butterfly's not bad either. Hope it's still splash resistant.